PinkBerri Ocean: (Luxury Trio w/PinkSpritz) A fuzzy peach, PinkScent with a touch of ripe melon, with a sweet breeze. PinkMelon: PinkMelon-(Luxury Trio w/PinkSpritz) -A soft but flirty fruity PinkScent with sweet juicy cherries, and refreshing watermelon. PinkVelvet (Luxury Trio w/PinkOcean Mini soak) A floral smooth PinkScent with a lingering hint of a sweet. 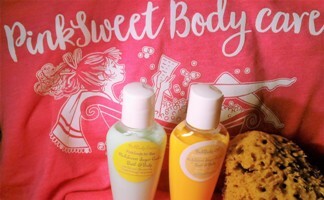 PinkCrush (Luxury Trio w/PinkBody Spritz)A PinkScent: A bowl of sweet treats with a classic rich, creamy powdered dessert. 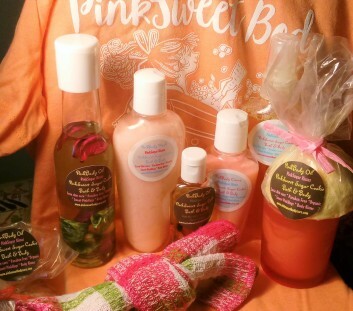 PinkGinger (Luxury Trio w/mini Salt Soak) A PinkScent: A burst of ginger with warm wood notes of caramel.